Only a Little Incompatible: My girlfriend and I have very different religious views. I’m humanist and she’s Christian. We are also very firm in our respective beliefs. 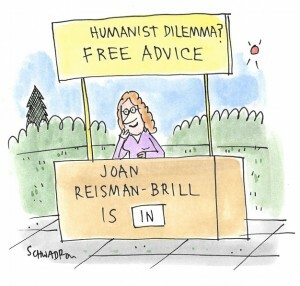 I haven’t brought up Unitarian Universalism yet, but I doubt she’d feel comfortable with it. Our religious differences don’t present a problem for 99 percent of our interactions, but there are a few spots where it causes friction. The second conflict just came up after we volunteered for a charity at a religious concert. I didn’t care for the music or the message, but she felt a spiritual/religious connection through the music. We talked about it afterwards and when I told her how I felt, it was clear that she was upset. It turns out she had recently heard about someone in a similar religious/secular relationship who felt lonely because her husband didn’t share her beliefs. My girlfriend didn’t think that feeling would happen with us, but then this brought everything up and hit her pretty hard. We were together in the same place experiencing the same stimuli, but she felt lonely because I didn’t get the same religious connection she did. We’re at a spot right now where everything else in the relationship is amazing, but because of this, she just now realized that our differing religious beliefs might make the entire relationship either extremely hard, or not possible at all. We both want the relationship to work and are planning to go to couples therapy to try to figure out how to make it work. What are some things we should look at to try to frame the situation in a way that we’re both satisfied? She won’t be changing her religious beliefs, and I’m still a staunch atheist. Congratulations to both of you for recognizing the serious implications of these problems and planning to pursue couples therapy. The sooner the better, and I will leave it to the pro to guide you through the process of how to approach this and what to ask yourselves. But I will share my take. Although I usually try not to be negative, I predict going forward you’ll find your overwhelmingly happy percentages slipping as the unhappy fractions grow in significance. When people are already married, and particularly when they have children, my advice leans heavily toward finding ways to work things out together. But when that isn’t the case yet, I’m inclined to suggest a pivot toward the exit. Now is the time to find relationships that truly work for each of you, even if that isn’t one that works for both of you together. You’re both facing compromises on things you hold dear, and setting up win/lose scenarios. This will only intensify with children who will/won’t be baptized—and then how will they be raised? Even if you never have children, your partner longs for you to share the way she feels about her religion, which you don’t and most likely never will. No relationship is ever perfect (although it may feel that way for a while), but what you describe are not just negligible little flaws. Things may seem 99 percent great now, but that tiny 1 percent crack has the potential to break you two apart in time, or ensure that at least 50 percent of you will be suppressing what you really want. Don’t talk yourselves into committing to a life together when you’re already exhibiting irreconcilable schisms. Be grateful you’ve had such a good run, and use what you’ve learned from this experience—both the pluses and the minuses—to inform what you look for in the future.